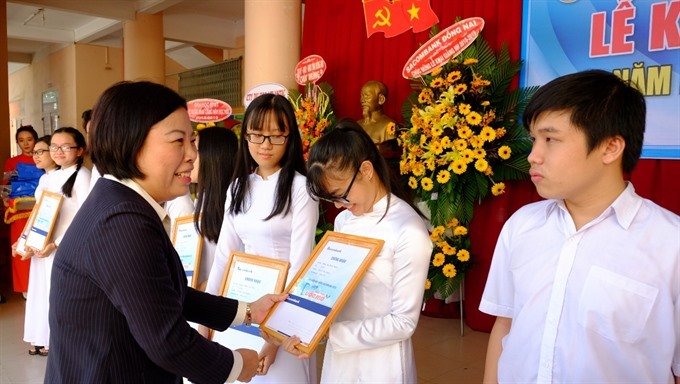 HCM CITY — Sacombank has granted 3,051 scholarships worth a total of VNĐ3.9 billion (US$167,589) to high school and university students at the beginning of the 2018-19 academic year. They were worth between VNĐ1 million and 20 million and the students also each received a backpack. The beneficiaries are 11th and 12th graders with an average score of 7 and above at schools in localities where the lender has branches, third-year university students majoring in economics, business management, finance-banking, and accounting with an average score of 7.5 and second-year students at the College of Industry and Commerce and Thủ Đức College of Technology. This year the bank has awarded full scholarships worth VNĐ20 million each to students at the University of Economics in HCM City, HCM City Open University and University of Finance – Marketing. To get a full scholarship, besides meeting the academic requirements, students also had to take a writing and presentation competition on the financial sector and on the operation of Sacombank in particular. The scholarships are an annual charity activity Sacombank has undertaken since 2004.